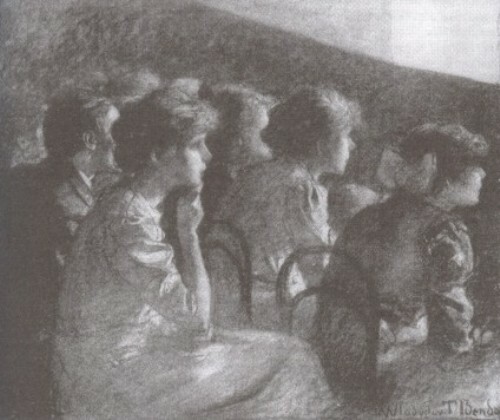 Text: Not only did we shout on the roads, but we also sometimes made a noise in the cinema, too, and in the theatre – not, of course, in the Playhouse, which we rightly regarded with reverential awe, but in the old New Theatre, where the number one touring companies brought London’s big musical comedy successes. Here were gaiety and pretty girls, and lively dancing, and catchy tunes, and loudly did we cheer artists like the enchanting Cora Goffin (now Lady Littler) and the comedian Arthur Riscoe. There were then three cinemas in Oxford (perhaps there still are) – the Super near the top of Beaumont Street, the Electra in Queen Street, and the Scala at the wrong end of Walton Street. At the Electra we saw the first and most memorable Beau Geste with Ronald Colman; at the Scala Lubitsch’s Foolish Wives, then looked upon as the last word in daring sophistication: and I recall one evening at the Super when we seem constantly to have interrupted the opening film of the programme with cries of ‘We want Laura! We want Laura!’, Laura being the then much esteemed, but now totally forgotten, Laura La Plante. Strangely enough no one in the rest of the audience seems to have objected to our behaviour: perhaps, without knowing it, we were the voice of the people. Frequently as we went to the cinema we did nor go half as often as Henry Yorke, who is said to have gone to the films six times a week all his years in Oxford. It seems to have done him little harm, either in practical or aesthetic terms. For he became a highly successful businessman in Birmingham, and as a sideline to his main activities a celebrated novelist under the name of Henry Green: the only novelist of our age, said Evelyn Waugh, to possess undoubted genius. Comments: Harold Hobson (1904-1992) was a renowned theatre critic. This part of his memoirs refers to his time at Oxford University. Foolish Wives (1922) was directed by Erich von Stroheim, not Lubitsch. This entry was posted in 1920s, Memoirs, United Kingdom and tagged Audiences, Beau Geste (1926), Cinemas, Foolish Wives (1922), Harold Hobson, Noise, Oxford, Performers. Bookmark the permalink.